With the world going to hell in a handbasket*, I walked out into the sunshine on Torch Street and headed for Milltown Park, the tiny scrap of green at the top of the street with some play equipment and a sign. Overnight, Milltown Park had become a Pokémon Stop, and I wanted to know a little more about it. I was delayed in getting there because about three houses down, my phone began to vibrate, announcing the presence of a crab-like creature on the road, a little virtual pocket monster. I had to stop and shoot it! I flicked the red ball at the bottom of my phone in the crab’s general direction. Ridiculously easily, my ball felled the creature and swallowed it up. The crab-thing was now mine. 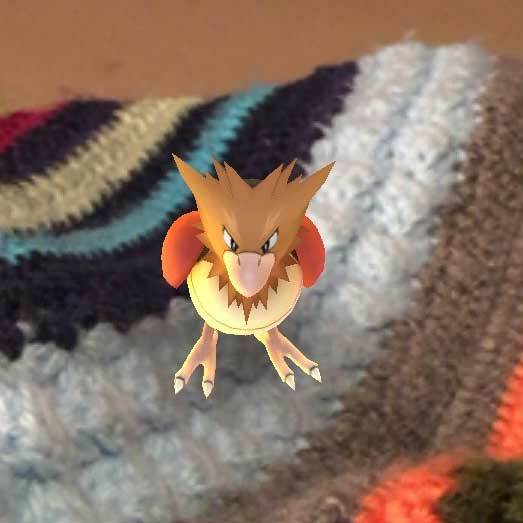 Today I’ve been gathering Pokémon and feathering my real-life nest with some cosy winter pillows and cushions. Other than the deliberate excursion to Milltown Park, I’ve been able to catch my Pokémon seamlessly, without going out of my way. 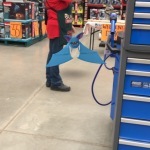 In Bunnings, as Steve bought an aluminium set square and mulled over how he might custom-build some bookshelves in the middle room, I found a bat flapping about at head-height near a Bunnings customer service person. I was the only person aware of and reacting to this purple bat; it was like being the only person able to see a ghost. I flicked my red ball at it. It bounced fruitlessly down the concrete aisle and disappeared from view. I tried flicking my red ball in different ways, from different angles. I took a few steps backwards to get the angle right, taking care not to knock over the hardware stacked on a display stand behind me. It took a few more goes, but I got my bat. I pocketed my pocket monster. As we went about our day, feathering our nest, Steve and I talked about how augmented reality could be a wonderful way to get to know local layers of meaning not visible to the naked eye: historical facts about a building; pictures of insects that live in a particular tree. Point your phone at things and find out more about them. That could be good. Next stop Spotlight to buy some fabric for new cushions. As I walked across the vast expanse of asphalt that is the car park at this new bulky goods retail paradise, I whipped out my phone to see if there were any Pokémon hereabouts. Nothing. The carpark and all the world around it were Pokémon free. I looked up at the buildings, the cars, quietly sitting in the sun and realised I was already seeing the world in a new way: a space that was now somehow negative, because of the absence of something. The absence of something that didn’t actually (or yet) exist. And yet the absence itself felt kind of real. Within a very short amount of time, the world has been blessed in some parts with Pokémon fairy dust and left languishing in Pokémon black spots in others. 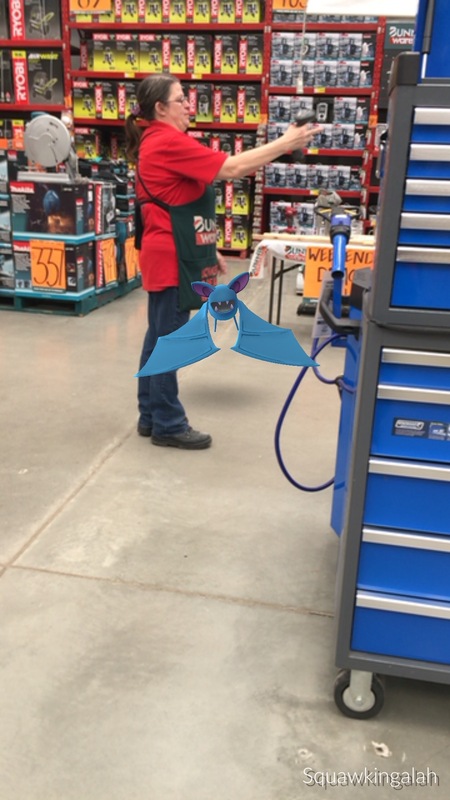 Why was the bat in Bunnings? Did Bunnings ask it in, as bait? If people come into your store hunting Pokémon, presumably their eyes might also be caught by the tangible objects available for sale. 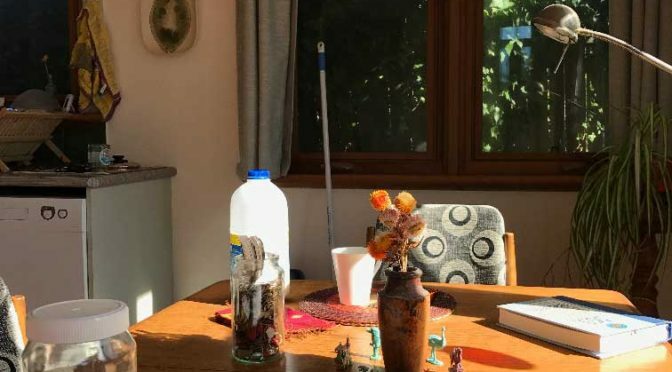 However these decisions are being made – or whatever algorithm is making decisions for us – for now, Bathurst Bunnings is a have, and Bathurst Spotlight is a have-not, in this brave new augmented world. Yup, Brave New World. While developers and gamers have been tinkering with augmented reality for many years, there is something decisive about the release of Pokémon Go. Unlike earlier projects, this is fun for all the family. I suspect reality may never be quite the same again, just as it was never the same again after the telegraph, or radio, or television, or the Internet (or fire, or the wheel). But in the meantime, glitches. 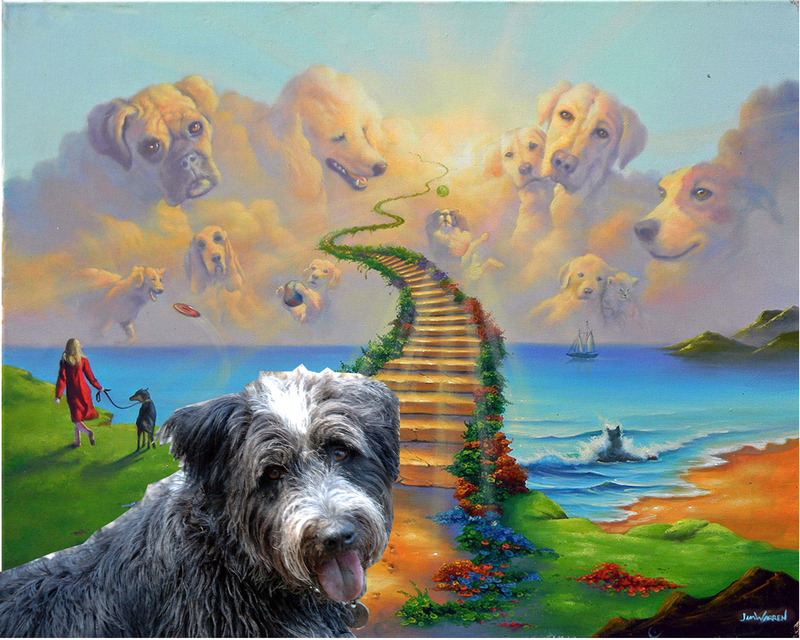 Later, with Steve, I took my old flesh-and-blood black Labrador to the Blayney Road Common for a gentle walk. Bertie ignored the kangaroos solem nly watching us in the golden light. I fired up my app. No Pokémon hereabouts, but I could see a Pokémon stop in the virtual distance. Ah. 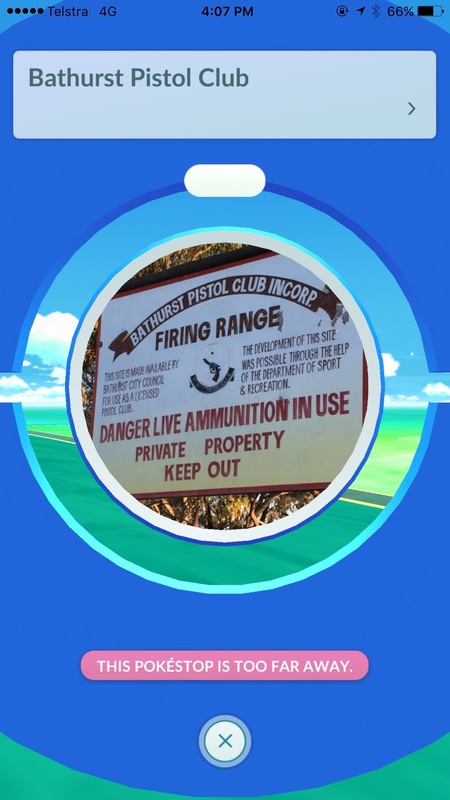 I tapped it and discovered that this PokeStop had attached itself to a real-world sign that says DANGER LIVE AMMUNITION IN USE – KEEP OUT. I was beginning to see how quickly this Pokémon Go thing could end up in tears. 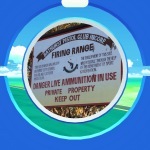 Having children shimmying the fence to get closer to the PokeStop in the middle of the local rifle range can’t be right. There is something eager and ignorant about Pokémon Go. It’s as oblivious to local sensitivities as the tourist who wanders into the Balinese Hindu temple in a bathing suit, tracking sand. The game will either learn how to work this stuff out, or risk being banned like the clackers. The clackers were acrylic balls on the end of nylon string that you’d clack together. They were a fad that took over my primary school one year back in the early 1970s. The concrete corridors reverberated to the clacking sound. Kids were soon sporting great lumps on their foreheads where they’d been struck in the face by fast-moving hard plastic balls. The school banned them and suddenly they were gone. Whether Pokémon Go is banned like the clackers or irons out its glitches to spread the fairy dust over the smartphone wielding world, one thing is certain: the way we inhabit physical space and tell stories about it is changing decisively. Robotic surgery means that surgeon and patient need not be in the same place, although at this point in evolution they still need to inhabit the same parcel of time (although even this could conceivably change, with a piece of surgery programmed in and the patient settling herself on the trolley at her own convenience to go under the knife). There was a woman on TV the other night with cerebral palsy who was playing a musical instrument just by moving her eyes. At moments like these there’s a sense that the limitations of our human bodies are being swept away, allowing us to enter some sort of cyborg otherworld that is part flesh, part code. I’m happy to catch some Pokémon on a Saturday morning, but I’m not sure I like where we’re going with all this, even if it’s bristling with benefits. I feel a bit like Rose R., the woman in Oliver Sacks’ Awakenings, who didn’t really like the world of the 1960s, with its blathering radio and television sets. She preferred her earlier, simpler world of person-to-person connection. Sometimes I’m not sure I really want to take these next steps, whatever they are. To take those steps is to enter a world with an operating system incompatible with the one currently installed in my brain. It’s friendly and fun but we’re also being colonised. My street, my town, the way I move about in space is being tracked and manipulated; layers of meaning are being added from some remote place (company headquarters are in San Francisco) by people who can’t tell a firing range from a park bench, because it’s all just coordinates to them (or their robots). I have some pocket monsters in my smart phone. 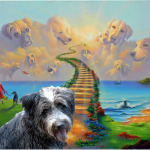 They exist in my mind, and they exist in this nebulous thing called the Internet. They’re sitting out there in Torch Street right now, nebulous creatures waiting for children to find them. But these pillows – you can touch them, you can rest your head on them. You can count on a pillow. And when I go to sleep tonight, I must resist the urge to slip my phone under my pillow and wake at three am to check on my pocket monsters. *A man driving a truck through a crowd watching the fireworks; attempted military coup in Turkey; others. This entry was posted in Bathurst, Bertie, PhD, Steve and tagged augmented reality, awakenings, pokemon on July 16, 2016 by Tracy. So! We’re already just over a couple of weeks into the new year. If you don’t watch them (days) they tend to escape. In just a few weeks – it’s not certain exactly when – we’ll find out whether the Powers That Be are going to go ahead and divert water from the Macquarie River into the wide open maw of an open cut gold mine. The quantity would be up to 10 megalitres a day, about four Olympic swimming pools’ worth. If the project goes ahead, the water will go out in an ordinary-looking concrete water pipe; the pipe will be laid down by people who are just going about their ordinary jobs; and then people will start working at the gold mine and earning good wages, part of which they will spend at the ordinary Coles or Woolworths supermarkets and perhaps the cafes and dress shops in town. In other words, a perfectly ordinary thing is about to happen. It’s all pretty routine, but hundreds of people are making it known that they don’t agree. 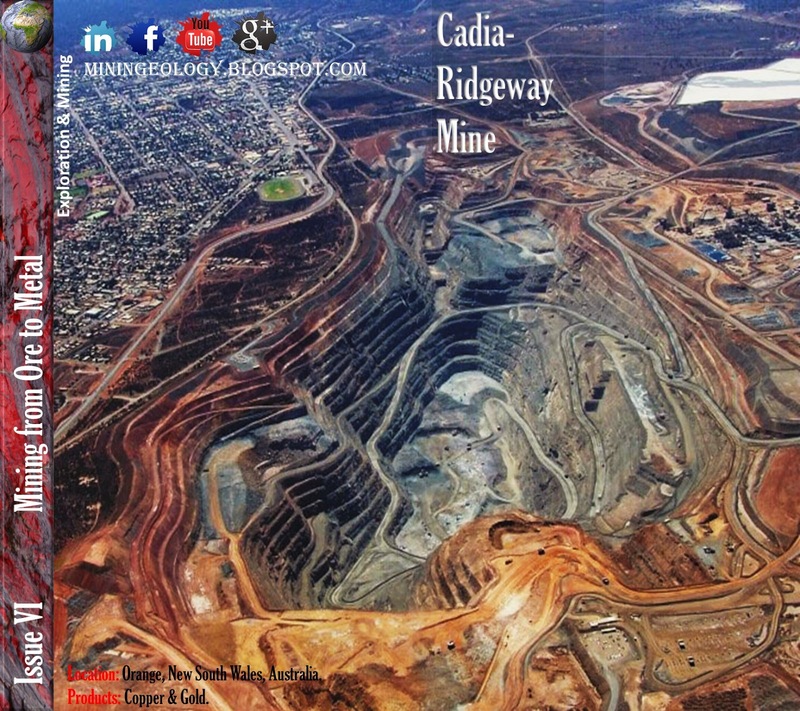 Opposition to the diversion of river water to the Regis gold mine is coming from all quarters – cabbage growers downstream, people who like to fish for Murray cod, people worried about diverting water out of the district just as global temperatures are rising, people dismayed by the privatisation of river water, people worried about declining flows into the fragile wetland habitat of the Macquarie marshes at the other end of the catchment. Kayakers, bushwalkers, people with dogs that like to swim (that’s me and my dog, Bertie). The nuns around the corner from my house. People who can’t see the point in another gold mine when we’ve already got an absolute whopper just down the road. Just because something is business as usual, doesn’t mean we have to keep doing it. 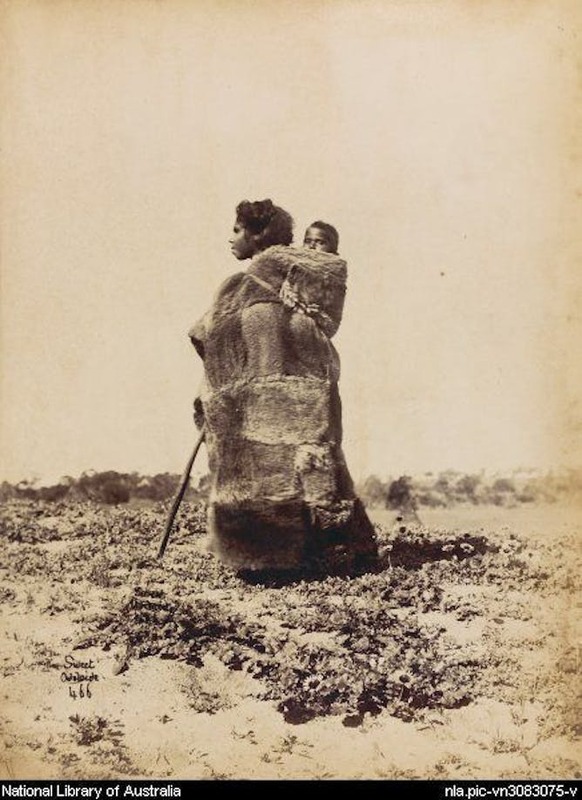 Smoking, slavery and foot-binding were once business-as-usual. So what’s a girl to do but take up her crochet hook and fight?! A small group of “craftivists” has been getting together on Thursday mornings to create a long, crocheted, knitted and textile-based representation of the Macquarie River. We’re hoping that by the time Council makes its decision we’ll have something long and colourful that we can brandish before the media and general public. The process has been wonderful so far. It’s both relaxing and, to use a rather over-used word, “empowering”. If you’d like to join in, we’re meeting at Rahamim, 36 Busby Street, Bathurst on Thursday mornings from 10am to 12noon. Come for the whole session or just part thereof. Or if you’d rather just work on a stretch of it at home (we’re asking for lengths that are 20cm wide by however long you like – ie narrow lengths that we’ll join together), you can just drop them off at Rahamim any time in business hours (ask for Sally). In my twenties, I remember reading a pamphlet by Ernest Mandel (I think it was, will check), called The Revolutionary Potential of the Working Class. If the working class has the ability to change the world, what about crochet? Question: Are you taking the piss? Answer: Yes. A little bit. But piss must be taken. Question: What is the revolutionary potential of crochet? Answer: I’m glad you asked. It has something to do with the meek inheriting the earth. Crochet is associated with the meek. Crochet is inherently non-violent; it’s unlikely that crocheters, even militant ones, are going to force anyone’s back up against the wall. (Airlines, however, beg to disagree. A crochet hook is a potentially gruesome weapon. Think eyeball, steel crochet hook.) If the meek don’t inherit the earth, we run the risk of the strong continuing to inherit the earth, and look where that got us. Also: You might have noticed that the word crochet has the word Che inside it. As we all know, Che was a revolutionary. So there’s the revolutionary potential of crochet right there! Che didn’t think think a new society would be very well served by people made up of all the faults and peculiarities of people who had lived in the old, bourgeoise society. So he said the Cuban revolution required a “new man“. People had to be different, or become different, if they were to build a new society. Question: What if you’re not sure you can be a new man? Answer: If you’re a man, you might become a new man by learning to crochet. The simple act of crochet could well challenge your sense of manhood and perhaps cause you to shed some of it. Question: What if you’re not any sort of man, old or new? 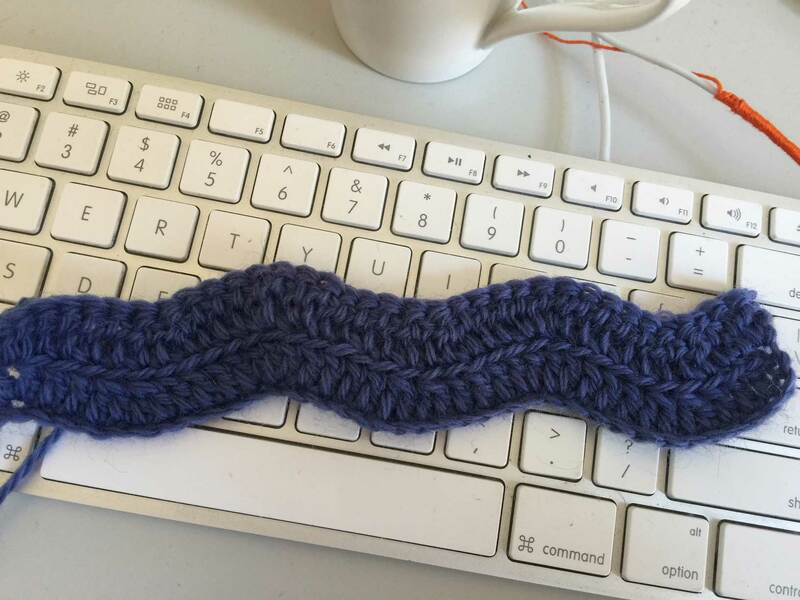 Question: Why are you focusing on crochet in particular? 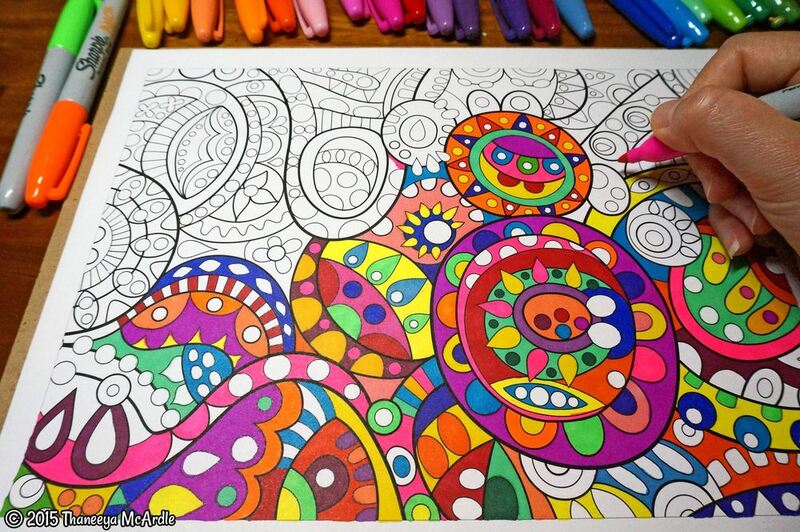 Wouldn’t you get the same benefits out of knitting or paint-by-number or adult colouring in? Answer: Perhaps. But every art form (and crochet is surely an artform) has its particular attributes. There could be something particular about crochet that gives it an edge in the revolutionary movement. For example, the Wertheim sisters, who got the crocheted coral reef going, say that crochet follows some of the fundamental, mathematical rules of biological growth; therefore crochet, as an activity, is connected through technique to the techniques used by Mother Nature herself! Question: So how is that revolutionary? Answer: I don’t know, exactly, but I’m sure there’s something in it. 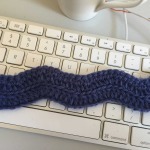 Maybe – if crochet has a direct connection to the very processes of Life Itself then it somehow connects to the Agency of all life on the planet. If we can respect the common or garden crocheted knee rug that is used by old people in nursing homes, we might also grow to respect the agency of all the background processes that keep life going on Earth. And then we might not divert rivers into gold mines, because we’d be thinking about the Booroolong frogs. Question: Agent as in Travel Agent? Answer: No. Agency as in the capability to ACT and to CHANGE THINGS. If you are incapable of action or changing things, you can’t have agency. You’re just a plum pudding. Then again, a plum tree, arguably, has agency because it is actively involved in the creation of plums. These plums change the world because now it is a world with plums in it. Question: So how is this revolutionary? Answer: Because Life. And I’ve been reading a book given to me by my friend Helen the other day. It’s called Blueprint for Revolution – How To Use Rice Pudding, Lego Men and other non-violent techniques to galvanise communities, overthrow dictators or simply change the world, by Srdja Popovic and Matthew Miller. Anything Lego men can do, crochet can do better. I rest my case. And here’s Ella Fitzgerald singing Cry me a River. 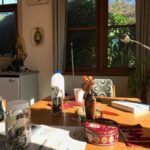 This entry was posted in Bathurst, Bathurst Community Climate Action Network, Bertie, Craft and tagged craftivism, crochet, gold mine, macquarie marshes, macquarie river, regis on January 16, 2016 by Tracy.